Fairway Manor is a 6,000 square foot fully staffed 7-bedroom/8-bathroom private villa nestled on a hillside amidst lush tropical gardens and overlooking the prestigious Half Moon Bay golf course. 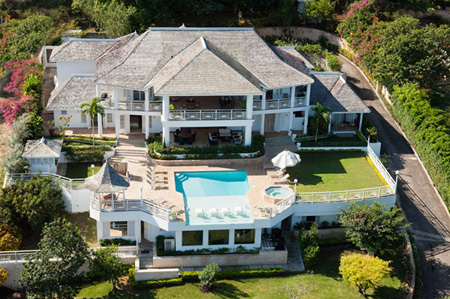 The villa is located in the Spring Farm neighborhood on the east side of Montego Bay. Fairway Manor was extensively and expertly remodeled and refinished and is now one of the finest large properties in Spring Farm. Everything is new and fresh. The owners have added an expansive bar and family room on the five bedroom first floor and a new stairway up to the second floor with living room, dining room, kitchen and two master bedrooms. The villa is designed so that most rooms open onto cool verandas and balconies offering spectacular views of the villa's gardens, Half Moon Bay golf course, and the blue Caribbean Sea and sky. Fairway Manor has a spacious high ceiling living room with entertainment center (52 inch cable TV, VCR, sound system), beautifully furnished on cool stone floors. French doors open to upper balcony. All upper level rooms open to the 900-square-foot covered balcony. The views of the Caribbean Sea and sunsets are magnificent from this upper balcony. There is also an office with computer and wireless internet service. The villa has a wonderful first floor family room with pool table, large wet bar, 52 inch cable TV and comfortable sofas and lounge chairs all opening directly out to the pool. All bedrooms are air conditioned with ceiling fans and private bathrooms. Bedroom also have 32 inch flatscreen cable TV. -Bedroom 3 -5 King-size or twin beds at guest's option. Private bathrooms have tub/shower combination and marble vanities. French doors open to the lower veranda, private pool and spa area. (240 sq. ft.) Bedroom #5 has a wonderful outdoor shower. The large infinity pool deck has a 16x28 foot fresh water pool and spa. There is plenty of room for lounge chairs, a gazebo and outdoor dining. From the kitchen, delicious meals are prepared by the live-in cook and served in the inside dining area, on the candlelit pool side veranda or the upstairs balcony. The villa also has a butler, housekeeper/laundress and grounds man. Short drive to many nearby golf courses including Half Moon Bay, the new Ritz Carlton White Witch and Cinnamon Hill.